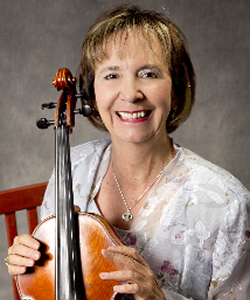 Mimi Dye, prominent American violist, violinist, composer and educator, is consistently praised for her artistic mastery, beautiful tone, and eloquent playing. Since her New York Debut Recital at Weill Hall at Carnegie, she has become well known to audiences throughout the United States and beyond as a soloist and chamber musician. Her engagements have taken her to San Francisco’s Herbst Theatre, the Sydney Opera House, Weiss Kirche in Germany, and Salzburg, Austria. Festivals where she has performed or taught include artist-in- residence at Four Seasons’ festival in Yachats, Oregon, the Australian Youth Festival in Sydney, and Capriccio Chamber Music Festival in northern California. Her orchestral engagements include performing with the Metropolitan Opera in New York City, the San Francisco Ballet, touring with Barbra Streisand, and recording movie scores in Los Angeles. Her first CD, “Spiritual Songs of Hildegard” her adaptation for unaccompanied viola of the original songs of 12th century composer Hildegard of Bingen, has been enthusiastically received worldwide. A composition student of Darius Milhaud in college, her own compositions for solo viola, string orchestra, and jazz ensemble have been described as “well-conceived, fresh and delightful!” A native of Oklahoma, Mimi Dye has studied at Mills College, receiving a BA in music, the San Francisco Conservatory of Music, Brooklyn College, where she received her MA in music, the Manhattan School of Music, where she pursued advanced studies, and Berkeley’s Jazz School. Her principal teachers have been Itzhak Perlman, Emanuel Vardi, Germain Prevost, and Nathan Rubin. A dedicated and passionate educator herself, she is currently teaching violin and viola and directing a chamber orchestra at her private studio in Palo Alto, CA.